- Slots for your business cards, cash. - Your phone will be surrounded by the phone case for full protection. - Exquisite workmanship--delicate stitching; top-grade hand feel. - Precise Cutout to camera, speaker, buttons and ports. Perfect Combination of Wallet and Phone Case,3 Credit Card Slots and 1 Cash Slot. ✔ Phone Case Only Suitable for Apple iPhone 7/8 (4.7") , Color: Black . If FBA goods is sold out, shipping by USPS also fast, usually delivery in 8-15 working days if you choose [standard shipping], much sooner than the system estimated delivery time. ✔ iPhone 7/8 (4.7") Case Structure: 3 credit cards slots and 1 cash compartments.Case wallet combo, perfect combination of wallet and cell phone case. Smart Design allows you to easily flip the inner holder to access all your cards conveniently. 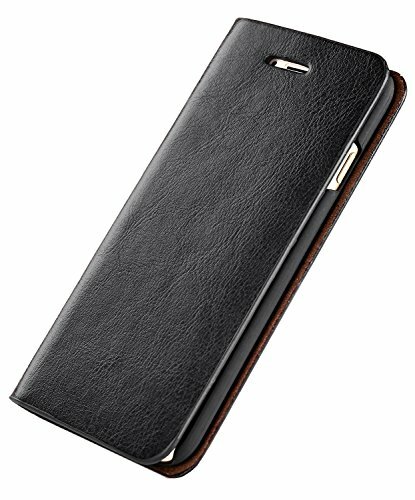 ✔ iPhone 7/8 (4.7") Case with Top-rated Leather Material: Cellphone wallet case are precision made from top-rated Premium PU Leather. They look stylish and feel great. ✔ iPhone 7/8 (4.7") Case with Durable Protection: Covers all four corners of your iPhone and includes raised edges to prevent screen scratches and to provide 360-degree protection and security for your iPhone, cash and cards. ✔ iPhone 7/8 (4.7") Case with Convenient to Use : Precise cutouts for speakers, camera and other functional ports allow you easy access to all ports and functions, without removing the case. If you have any questions about this product by BENIMIL, contact us by completing and submitting the form below. If you are looking for a specif part number, please include it with your message.